Well today was pretty uneventful! I am having a hard time getting back into the groove after 2 weeks of "vacation". Makenzie did great in therapy today! She is still much looser and her ATNR is seems to be a lot less frequent. She is also flexing much less! She also showed me several time today where her eyes and nose where! I love it when she does things more then once! I spent a good amount of the morning on the phone with contractors to get bids for the painting of the exterior of my house. I met with 2 companies this evening and once again God shines through! We had a hail storm several weeks ago and they included money to have part of the house painted. Well the company that came today offered to paint the WHOLE house for what the insurance company gave us! AMAZING! I feel so blessed by their generosity! This is a huge burden that has just been lifted of my shoulders! We are also going to be getting some bids to have hard flooring put down on the main level of our house. Makenzie is getting so good at walking in her gait trainer but has no where to walk. She is not strong enough to push it on the carpet and that leaves one hallway in the entire house that she has access to on her own! No bueno! Please pray that we can get a great deal on this as well!! I am so consumed lately with Gods love and grace! It seems like every time I turn around he shows me his face! 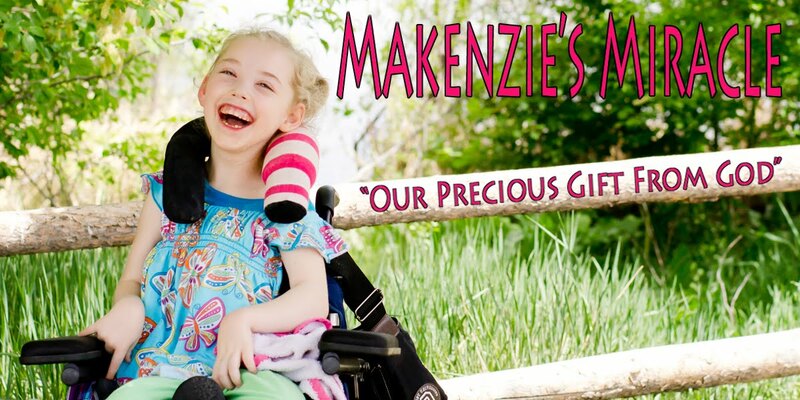 Please keep praying for Makenzie to respond to the Stem Cells Therapy! It is so hard to play the wait and see game! I know that God has a plan and I am trying really hard to wait patently! HARD doesn't even begin to describe it! Please also pray for a new friend! I love meeting new people! However, in the cyber world it usually mean that there has been some sort of tragedy! In this case that stands true! Shauna's little boy Christian fell into a pool 2 weeks ago and is in the PICU with a global brain injury! Oh how I remember those days! Please visit his site listed to the right! I would not wish this journey on ANYONE but what has happened can not be changed and now all we can do it pray! Please keep praying!!! Believe... Prayer Works!